I spent some time with Venice today for the first time in nearly a week. We had a few very rainy days, then my surgery, then a couple more days to shake off my rather extreme reaction to all the anesthetics, painkillers, anti-inflammatories, antibiotics, etc. (apparently morphine is NOT my friend!). She has reverted to her feral state a little bit. She was back to being highly suspicious of my motives. So I brought King in again. 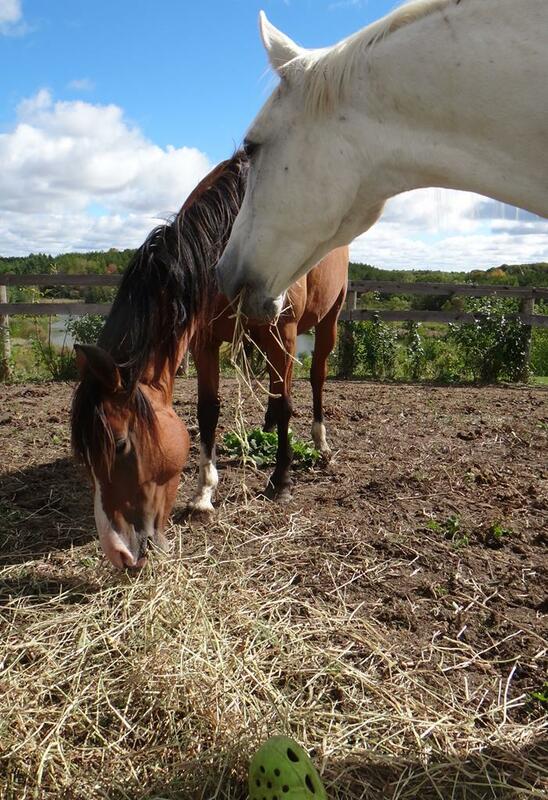 First I left him with her for an hour so he could scour the entire paddock for leftover wisps of hay. 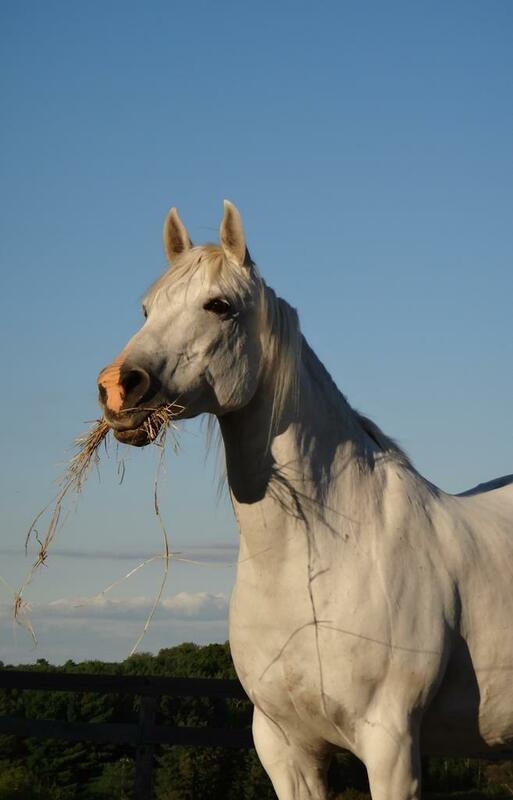 Then I went out with a pocketful of cookies (roughage chunks – basically ground up hay with some probiotic stuff. King thinks they are delicious… of course King thinks everything is delicious…). We played a super simple clicker game of ‘follow me’. He followed and I clicked and treated him every few steps. It was very elementary for King, and I think he found it sort of boring. But Venice was fascinated and followed along surprisingly closely. We did circles and figure eights, and an occasional reverse. She kept up with it all and even cut in front of us a couple of times to get a little better view. Eventually I ran out of cookies and sat down. 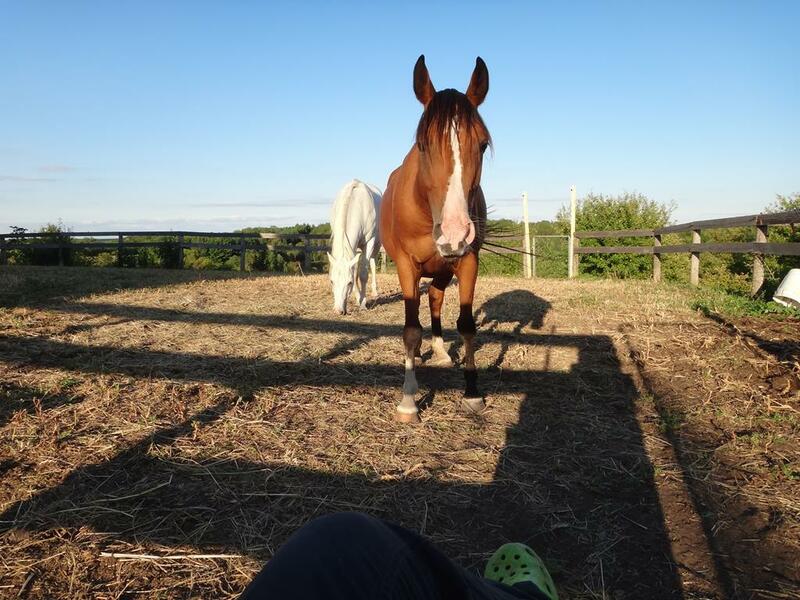 King stood over me and licked my hand for a long time (an odd habit he’s had since he was a yearling – I think it’s actually a stereotypy… a stress behaviour like weaving or cribbing in horses, or nail-biting in people). I don’t usually let him do that for too long since he would lick the skin right off me eventually. But today I thought it might be good for Venice to see that he thinks of me as his ‘safe’ place. She was certainly interested. I hope she’s getting the right message from it. My elbow is a bit achy, but the surgeon told me that the procedure went well. He put in a plate and several screws. I am not allowed to do anything for two weeks. And I am off work for two months. I am already desperately bored. Typing is very slow with one hand. So I can’t even do anything productive on the computer. But I guess the bright side is that I won’t be tempted to rush anything with the little mare! Just back from the fracture clinic. There is no sign of any healing in the CT scan. So I am scheduled for surgery tomorrow morning at 8 am. The surgeon is going to try screwing the bits of elbow back together with a plate. It is day surgery, so I should be home again by evening. He reviewed the x-rays from the first fall (on July 27) and saw evidence of a fracture then. ER doctor missed it at the time. Said it was just soft tissue damage. Typing is slow and awkward, so likely won’t be posting much for a while. Three months is the estimate for recovery. Played with Venice for quite a while today. Mostly using a mild roundpenning technique. I walked around after her and whenever she stopped and turned towards me I stopped and knelt on one knee. She let me get very close by the end of the session. What are you? And what do you want from me? No. Definitely cannot commit to a relationship yet! Really… who cares where dinner is served? She ate her entire dinner from the bucket on my knee! I went to the fracture clinic again today. They did a CT scan on Thursday so I got the results from that. Not good. The inside of the elbow joint is shattered. So it is quite a bit worse than the diagnosis of coronoid fracture that I got last week. This doctor is now talking about the possibility of a complete joint replacement. I am back in a full cast. He was very unhappy that I have just been in a sling for the last few days. Another appointment next Tuesday for a CT scan to see if it is trying to heal at all. I forgot to say a couple of things in yesterday’s post about Dressy. Dressy is a very dominant mare. She’s a good leader with the other horses. Strict but fair. I believe that at least some of her spookiness relates to that. 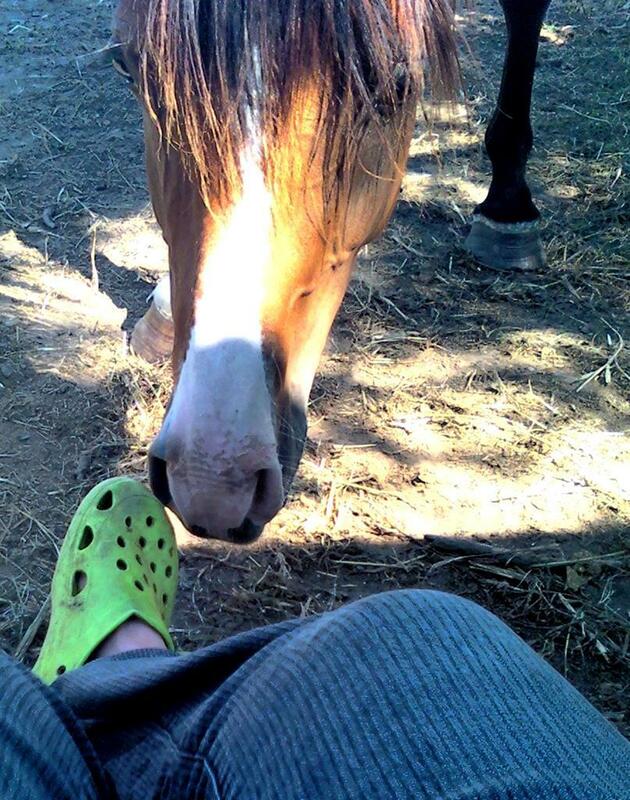 Most of my horses are very respectful towards me. They yield space to me very easily. They give me a nice bubble of space. They are polite. Dressy… not so much. She loves me. And she is very friendly. But she’s also very disrespectful in a gently obnoxious, bull-moose sort of way. Every so often she will try to go through me instead of around me. Just as if I wasn’t there. Sometimes we have arguments on trail about which is the “correct” trail. She is sure that I have no sense of direction at all. We have periodic episodes of head knocking which sets her back in her place for a while. But her dominance rises to the surface again eventually. I think that when she’s out in front on trail, or being ridden alone, she feels that she really cannot absolutely depend on me to keep her safe, and that she becomes hypervigilant. King, in an emergency, will stop, turn his head and ask for help. I can talk him through scary things, or get off and lead him forward and he obviously trusts me to deal with whatever danger he perceives. Dressy just wants to leave, and she doesn’t really care if I go with her or not. It’s a bossmare’s job to make those decisions. If I put enough time and effort into it, I think I could overcome all that. At least to some degree. There are holes in her training. I know what they are (since I’m the one who left them there… mea culpa), and could do the work to repair them. I just don’t think that there is any point in doing all that under the circumstances. 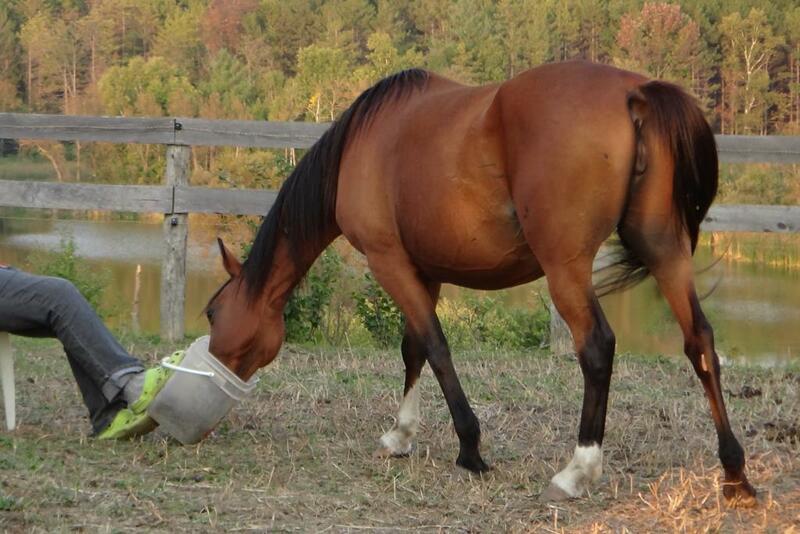 I might just as well put all that work into a horse who is more suited. As I said in an earlier post, Dressy is officially retired from competition. She is perfectly sound, and I will likely still ride her at home in the ring at some point. I’d like to do a bit of dressage with her, just to work on my own skills. But nothing on trail. And she is going to get a year or so to get “un-fit” first. 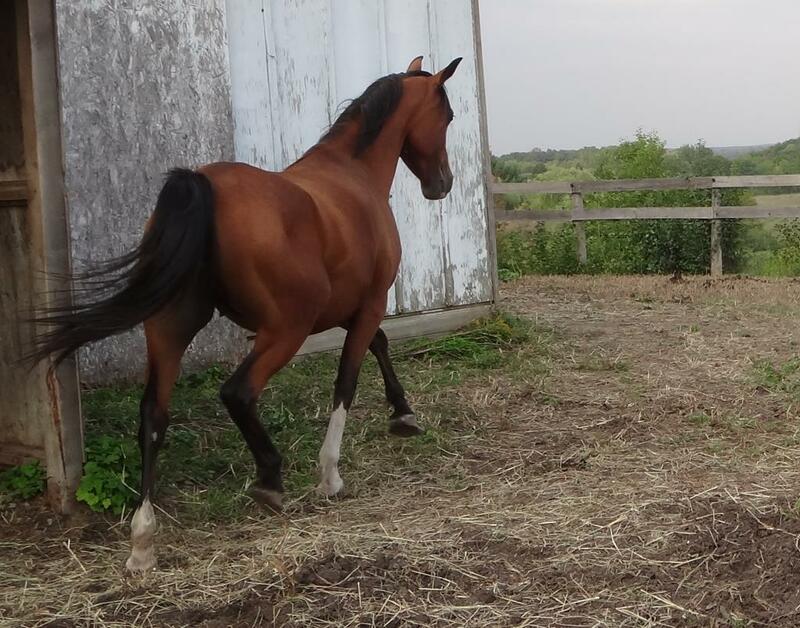 I’ve come to realize that there was a good reason she was considered too difficult to jog back in her racehorse days. In those days, her groom used to “tow” her for exercise. Which is the term they use for ponying or leading from the jog cart. Often, it’s used as a short cut to get two horses worked instead of one when there’s a time crunch. But Dressy was considered too difficult to drive and was even difficult to tow. She was very difficult to rate in races too. 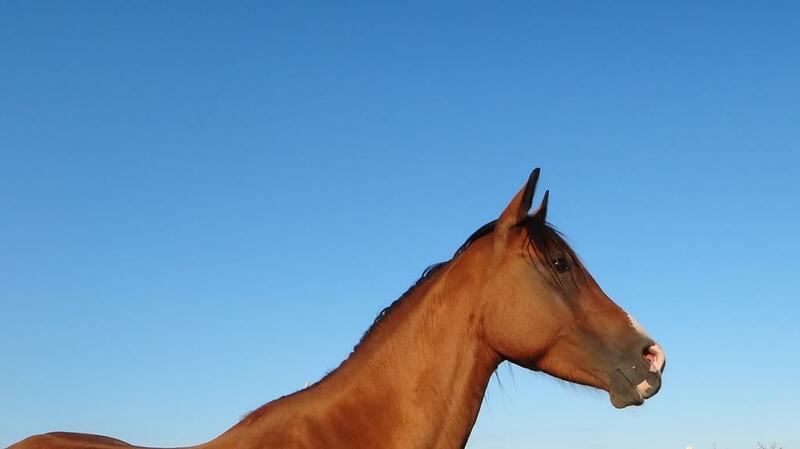 When I first got her, I gave her a few months off and let her relax and be a horse. When I started to ride her, she was soft, easy, and relaxed. I had no problems with her at all. It was a bit of a puzzle to me that she could have ever been considered difficult. All went well for a long time. We ambled around on trails, and though she had the occasional spook, it was nothing remarkable. I had no big plans for her. She was just meant to be my spare horse. To have fun with. Then I went through that crazy time with King when he went missing for two weeks (and no, no one ever figured out where he was all that time). 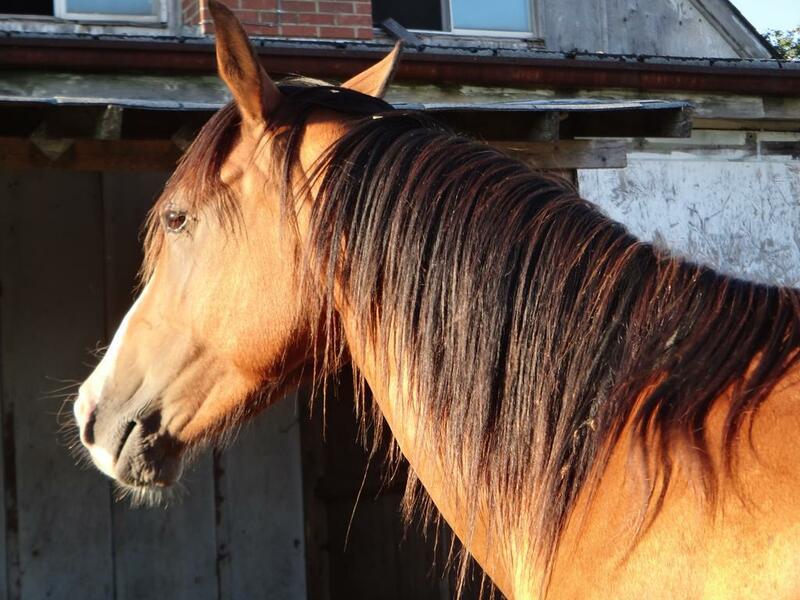 He was found with swollen legs, a high temperature, and a bad cough. The vet diagnosed a respiratory virus, and he really didn’t come back to good health for about six months. So I rode Dressy instead. 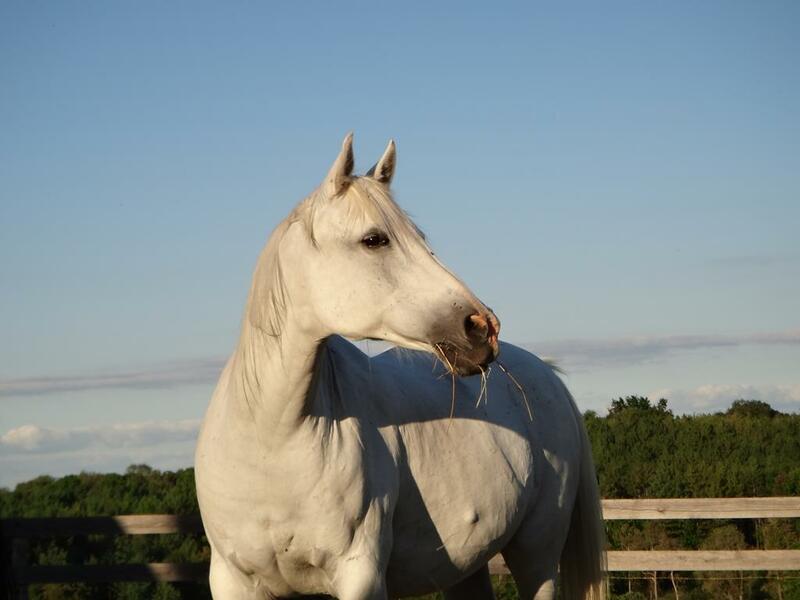 I soon realized that she was an amazingly athletic, forward, hard-working mare. Sound as a rock. And that she has great heart rates. So I started competing her. She did very well that first season. It took longer to fit her up than it did with King. But once fit, she was very competitive. She did start to spook more as she got fit though. I thought that she just needed more trail time. The second season, she seemed to be ready to do a slow fifty. I was still, in those days, riding her in a gentle snaffle. BIG lesson, starting that fifty! No brakes. And I do mean NO brakes. She went off like a rocket at the start. At first, I was almost having fun in a scary adrenalin-drenched sort of way. But a few miles through the loop I started looking hard at my GPS. Holy cow. We were trotting at around 17mph. I tried to take hold and crank the speed down. Halfway through the loop, there was a trot-by check with a lay judge watching. She was in a gully. The trail went down a steep sandy hill, turned right at the bottom, went along the gully perhaps fifty or a hundred feet, and turned left back up to the top of the other side of the gully. Dressy went down that hill, pacing. I cranked her sideways to try to force her down to a walk. So she paced sideways all the way to the bottom. Sue, the lay judge, asked me how I was doing as we came down sideways. I had only a second to reply “Too DAMNED FAST!” when we hit the bottom of the gully, facing backwards on the trail. Dressy executed a perfect rollback, stepped right into a racing gallop, and was at the uphill turn in about three strides. So much for the “trot by” part of that check. We finished that 12 mile loop in an hour and ten minutes. Which is, if you’re trying to calculate… just under 11 miles per hour. Way WAY too fast for a first fifty. She did slow down on the next two loops. But the damage was done. We made it to 37 miles. She stopped eating and I told the vet she was done. Once home I had the vet pull blood. Turned out that she had a mild tie up. She did pretty well in CTR, since the race mindset wasn’t there. 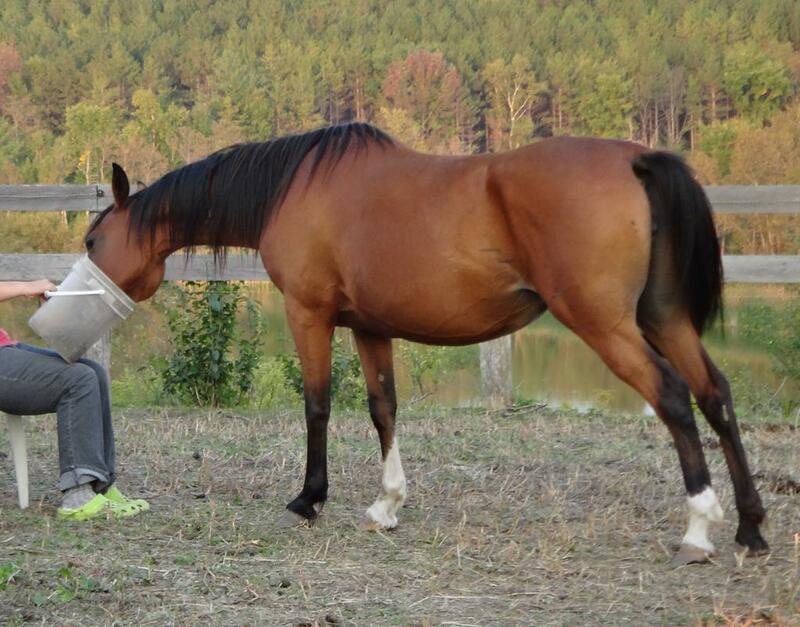 When she just goes out with another horse and stays with that horse, she seems to be okay. She had another year off somewhere in there while I rode King. Then Brooke rode her for a season, and they did well together. Going slow and relaxed and always with another horse. But last year, I did a bunch of Set Speed rides with her. We had fun, and she did very well at the shorter distances. But I think the mass start and the speed triggered race brain (maybe in ME as well as her). Last winter she started getting crazy again. The spooking got worse. And she began bolting. I’d ask for trot and suddenly we’d be in a racing gallop. I could steer (kind of), but not slow her down. I tried going out and walking. Miles and miles, and many hours of walking. But she has developed a level of fitness over the last year that is far and beyond what it’s ever been. And the walking seemed to maintain that fitness as well as anything else. Normally that would be good, but with her, fitness seems to bring on spookiness. She’s reached a point where she’s spooking violently even walking (which is what happened to my elbow). This year, she developed Anhidrosis. Which I believe is what triggered the Atrial Fibrillation that sent her to Guelph for treatment. The A-Fib was treated and she has not shown any sign of it since. But the anhidrosis has not changed. I can control it by giving her Guinness and One AC. But as soon as she goes off it, it returns. I love Dressy (despite what she’s done to me!). And I think it’s become too risky to compete her. To both of us. While I can finesse her through rides, I think there’s probably too much risk of some kind of serious metabolic crash. Whether it’s tying up, thumps, heart arrhythmia, or something else. 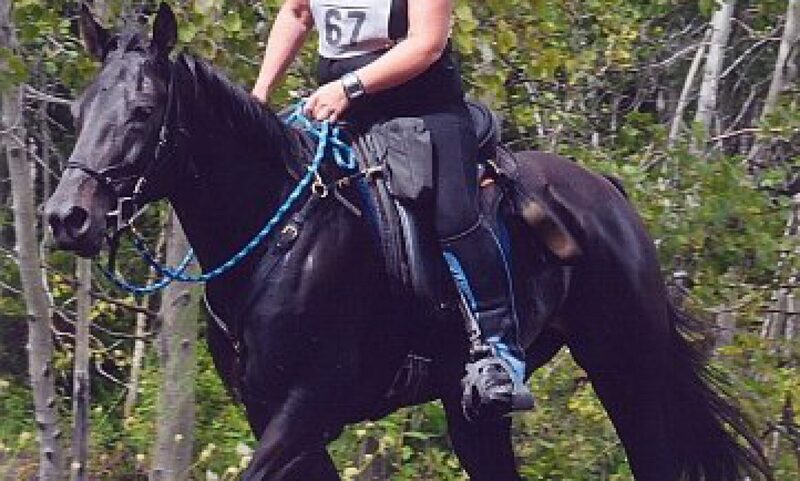 And given that she gets spookier and less controllable as she gets fitter, I’m going to get myself killed riding her. So for both our sakes, she’s out of competition. I went into the fracture clinic today to have more x-rays taken. The doctor there gave me some more details about what was going on with my elbow. He tells me that it’s a “coronoid fracture”. Which basically means that a little chunk of the joint broke off. He thinks I hyperextended the elbow during the spook and that’s what caused it. That makes sense to me, because I felt something pop in the elbow, and suddenly had no strength in the arm or hand. She was spooking to the right, and it was my left elbow. So when I abruptly let go of that rein, I toppled. They removed the half cast (oh blessed relief!!!) and gave me a sling instead. After x-rays, they sent me for a CT scan. I have to go back again on Tuesday to see the doctor who specializes in elbow surgeries. They are not sure if I will need that or not. Hoping not! Today’s doctor gave me very strict instructions not to use the arm to do anything (I hope he didn’t actually mean typing…). Especially not getting on a horse. At all. I promised solemnly and he glared at me. “You riders all LIE!” Made me laugh, because I know it’s true. He did however, get very serious and tell me that he sees some really bad injuries from riding. And when I mentioned Misha’s injury, he told me that he was the doctor who treated her and that was one of the bad ones. In the meantime, I’ve been sitting quietly in Venice’s paddock most days. She is very interested in me. When I walk around the paddock, she follows. She is now coming up to touch me nearly every time I go out. It’s just a fleeting little brush with her nose. And it’s easy to drive her away with a noise or sudden movement. But she’s just a little braver each day. I went out today, as usual, to sit in Venice’s paddock and read for a few minutes. And as usual, she hustled right over to see what I was doing. She never gets too close, just watches me with fascination for a while, then goes away to eat. Then comes back and stares for a while longer. Today, King spent about an hour in Venice’s paddock. First I let him chat with her for a few minutes. 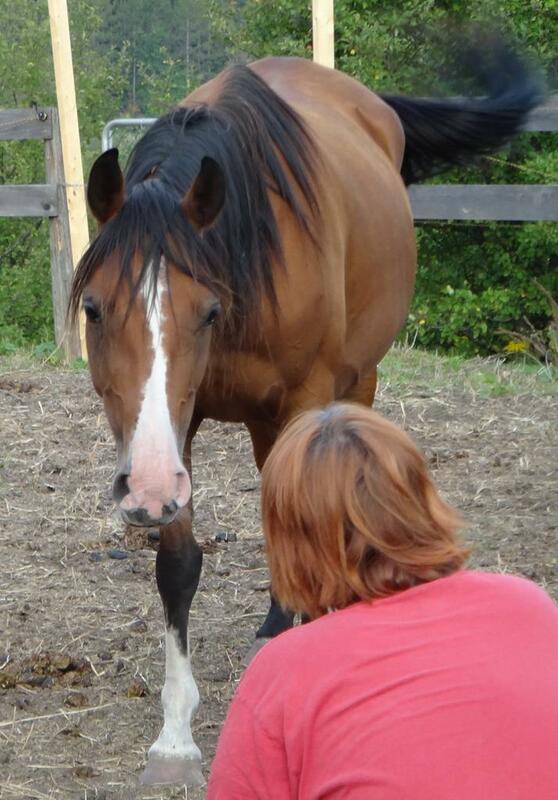 After they exchanged some equine greetings, I brought some treats in and started clicker training King. We practiced all his old stand-by behaviours. Putting his head down on cue, lifting whatever foot I pointed at, targeting my hand with his ear, kisses (be gentle please! ), free leading, lateral movements, etc. I didn’t bother teaching him any new things. Just went through his best stuff. He was, of course, thrilled at the whole idea, and performed with great glee and quite a few accompanying throaty nickers. Venice watched with obvious amazement. She tried a couple of times to get close enough to look at what I was rewarding King with. But King was rather territorial about his cookies and managed to politely interject his entire body between Venice and the treats. When we practiced free leading, Venice trailed around right behind us, trying to figure out how to join in to this game without actually touching the human. She never took her eyes off us for the whole training session. After a short clicker session, I moved out of the way and sat in a chair to watch the two of them and take a few pictures. King ate hay and flirted with the little mare. Venice ate hay and puzzled over the human. Her neck is pretty scrawny, but she is very underweight right now. It should fill out a lot with regular groceries. Mouth stuffed full… as usual. King is as handsome as ever. But snow white all over. Every single dapple is gone.